(Newser) – After 125 years in business, Sears could now be in its final hours. 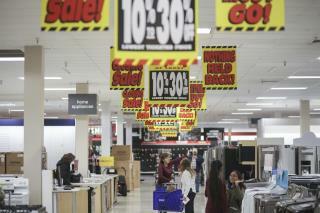 The iconic retailer, which filed for bankruptcy in October, may have to be liquidated if a bid to save it doesn't materialize before a 4pm Friday deadline. Chairman Eddie Lampert has proposed a $4.6 billion bid to buy the company as a whole through hedge fund ESL Investments, but sources tell CNBC that he had failed to submit a bid or secure financing by Thursday afternoon. The sources say that ESL is the only party that has offered to buy Sears as a whole, meaning the liquidation process will begin unless he manages a last-minute bid. Man thinks, that with higher education, experience, making connections, right social circles, scratching backs, brown-nosing, kissing a$$ and bribing is the way to go to not only climb the ladder, but operate business, not to mention it is his modus operandi. Although, if a company refuses to make the right choices, decisions and or the lack there of, then it will suffer the inevitable, becoming history, due to its lack of making the right choices and decisions, to keep what made them what they were and could have been. From my personal opinion, both Sears and Kmart were dated looking, stores were not kept clean, organized and presentable to the general public, workers that were there, were not there to work and did not know their merchandise, essentially to ask a few questions to ascertain the customers needs and wants, then satisfy it. Going back in time, stores were well oiled machines, they knew their customers, anticipated their needs and wants, treated workers very well and with all that, things worked. As time went on, needs and wants changed, but companies and the 1%’s need for more money grew and CONTROL, GREED POLITICS AND POWER TOOK OVER. Not to mention, the need to please the Board, Stockholders and meeting Projections, they forgot to PLEASE THE CUSTOMERS, thus the end results, is those companies and brands were lost to history prematurely. Other things, like NAFTA and using other countries for Customer Service and Tech Support have done “Wonders” for everyone . . . . . . . NOT ! ! ! It is sad ?? to see JCPenney, Kmart, Sears, Nieman-Marcus and other trusted companies and brands disappear, but then Satan and or Man’s world is winding down, coming to each FINALE ! ! ! I recall buying my first bicycle at Sears almost 60 years ago. Back then, their prices were more in line with the working class people. Over the years their pricing has increased to be more for the highest paid "middle class." In one way, they have priced themselves out of business like many other department stores who were chasing the higher income shoppers and losing their customer base in the proves. They can put the blame on the Walmart and Target stores but it was their own marketing and chasing the wrong customer base that has influenced their downfall. It is a shame to see this store close. Sorry to see USA made Craftsman tools go away. Snapon USA made gone next?